3:25:41 -- A New Personal Best!!! Well, its over, and I did it. When I started this fall's adventure, I was looking for a 3:25 marathon time. My target pace was 7:50 per mile or 4:52 per kilometre, which would bring me across the finish line in 3:25:14 or 3:25:22 depending on which measure you used. But I would have been happy with anything faster than my previous best of 3:29:01 achieved in Virginia Beach over 2 years ago. Everything went according to plan. I was relatively relaxed going into the run. Coach Brian and I had split a litre of wine with our spaghetti dinner on Saturday night, and had a couple of other beers during the day, so we each got a good night's sleep. Jenny, who was battling a bit of a cold, unfortunately didn't sleep so well, but was able to support us both in spite of not feeling 100%. Brian was battling some knee pain in previous long runs, so we decided that he'd run with me for the first 3 miles, just to keep my speed in check, and then join me for the last 8 miles. While we were targeting 7:50/mile, we started off with the first three miles looking for 8:00 per mile which we achieved easily. We met Jenny at a corner in the route and he left me on my own. By the time I saw them again at the halfway mark, I was pretty much bang-on my target time -- just ahead of target by about 20 seconds or just 1 second per kilometre! While the Road2Hope Marathon is a significant net downhill, the first 13 miles had lots of gradual ups and downs. So I was happy to see the top of the Red Hill Parkway where I knew it would be a significant downhill for 6 or 7 kilometres. During the time on the Parkway, I let my speed increase a bit, from 4:52/k target to no faster than 4:30 per kilometre. So by the time I found Jenny and Brian at the 29K mark, I was about 2 minutes and 20 seconds ahead of schedule -- yet my quads weren't too beat up from the downhill running. But I knew that the worst was certainly yet to come. Brian and I kept a very consistent pace for the next 6 kilometres. At the 35K mark, with just 7.2K to go, I was starting to fade -- and that is where Brian kicked into gear to keep me focused -- head up and concentrating on my stride, not my watch. I kept struggling and with about 4 kilometres to go told him just to not let me walk. And if the wind was causing me issues, I'd just shout "wind!" and he'd work to get in a position to block it for me. The toughest part was the last kilometre. We had to pass by the finish line and go around the water slide in Centennial Park and then return to the finish. I was really struggling and really, really, really wanted to walk. But with Brian's encouragement, I kept going. With 200m to go he told me to give it a final kick and I started to pass a couple of other runners. But one runner wasn't going to give up without a fight, so we ended up racing across the finish in a full-out sprint. Chip time: 3:25:41. Personal Best. Boston Qualifier by over 5 minutes. I'm now a '3:25 guy'! "The hay is in the barn..."
...and I don't think it has gone mouldy. Metaphorically speaking, "the hay was in the barn" after I did my longest training run 3 weeks ago. There is little, if any, muscle that is going to be built while tapering. The goal is to "keep the hay from going mouldy" by doing gradually shorter runs and let the muscle damage heal. So today's tempo run wasn't about speed or endurance -- it was just about keeping me from going stale. At all target paces, I had to slow myself down. The first three miles I simply couldn't seem to go as slow as the 8:20/mile pace I was targeting. Sooooo... I'm ready. We'll see how it all goes on race day! for an average of 7:44. It took a while to find the rhythm, but once I found it, I was able to cruise along with little varation in pace. If anything, I had to get myself to slow down as a couple of times I found myself creeping up to the 7:30/mile range. The cool weather was definitely nice. I had an excellent speed work session today. My goal was to get 7 1-mile repeats in this morning. I bailed on running last night -- the normal Tuesday evening speed work time -- because it rained all day and well into the night. So it definitely went well. The temperature helped -- 10 degrees C. -- but it was humid with the fog fairly thick through out the run. But the fog kept the sun at bay, too, so maybe that was a good thing. I'm feeling stronger and more confident as we get into the higher mileage weeks, which is good! I had a really good long run today. The Legendary John Ferguson's marathon training group had a light day today because most of them are going in the Corning Marathon next weekend. 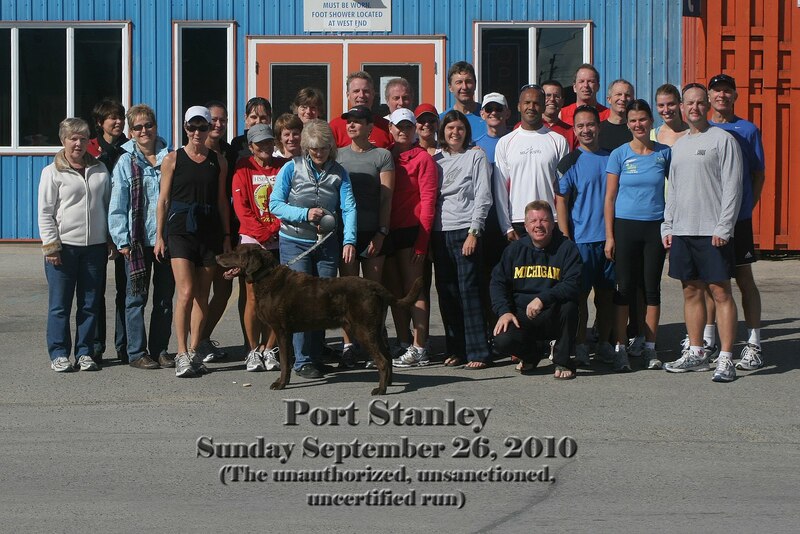 So Janice and Nancy organized our own run to Port Stanley from London and there were about 30 runners who took part. I started at what was supposed to be the Saturn Saab on Wharncliffe Road -- but it is now a Saab/Suzuki -- so it took us a while to figure out if we were at the right place. In any event, I started my run 9 minutes early at 7:44 am and the plan was to run the first 24 kilometres at 'long run pace' (5:11/k, 8:20/mile) and then do the last 8 miles or so at race pace (4:52/k, 7:50/mile). The weather was excellent. No wind to speak of, and the temperature when we stated was around 8 degrees C. When we finished, I'm guessing it was around 14 degrees C and the sun was shining, which made it feel warmer than that. But all in all, pretty good running conditions. My average time for the run was 5:00 per kilometre. There were 7 water stops along the route, and I stopped at them all for an average of 1:12 -- but it was a bit longer at the last two stops when I was working harder (and they had fruit!). My plan was to run faster down the hills and slightly slower than target pace up the hills -- which is why you see the 5:15 and 4:55 paces in the list -- the previous kilometres more than made up for the slowness in those laps. Anyhow, tacking on another 3.2 would not have been a problem today. My left ankle was talking to me just about the whole way (but is fine now as I'm typing this post) and both calf muscles were screaming at me near the end -- but nothing I couldn't handle. All in all, a good run! With Coach Brian's sore hamstring, he wanted to take it easy for his run tonight. Fortunately, 'easy' for him is tempo pace for me, so we ran from his place for our 8 mile tempo run. The run was shorter this week for three reasons. I was just barely recovered from my long run last Monday, and I was due to run my longest long run of the training program thus far this coming Sunday -- 22.68 miles. Despite the fact that the run was 2 miles shorter than last week, it was still a tough run. It was warm and humid out so the air was a bit thick. We were able to carry on a conversation for the first 4 'easy' miles, but when we turned around to head back to Brian's place, the conversation dropped off noticably. I was breathing hard. There was a wind from the south, but to me it felt like it was a tiny bit into my face, so I had to work hard to keep pace. But, strangely, I managed to get stronger throughout the fast part of the run. We were looking for between 8:20 and 8:40 per mile going out, and 7:30 per mile coming back. So we were right in the range the whole way. The best thing about taking off from Brian's place, though, is the ready access to my favourite form of rehydration: Guinness beer! A couple of Guinness and some stimulating conversation with Brian and Bridget and I was fully recovered! Today I joined the legendary John Ferguson's Runners Choice marathon training clinic at the TD Waterhouse Stadium track at the University of Western Ontario in London. The speed work tonight was to be 7, 8 or 9 mile repeats and Brian and I thought 7 would be good since I'm still quite a ways out from the marathon. As I started my warm-up mile I could feel my left calf talking to me. It was still tight from yesterday's long run. But as we got into the first speed work mile, it didn't feel too bad. I ran with Rishi Kumar who had paced with me at the London Springbank Park Half Marathon a couple of weeks earlier. Our speeds are pretty close to the same. It was warm out tonight -- 25 degrees C. (77 F) when we started and a bit muggy. So by the time we were done our first lap, we knew it was going to be a tough night for running. We targeted 7 minute miles and our first was a bit fast -- 6:47. But most of that extra speed was in the first lap, so we had settled into a nice pace for most of the run. The next three laps were just a second or two under the 7 minute mark, so we had a good steady pace going. But by then, a problem started appearing. That sore calf was beginning to really talk to me in that 4th mile. I chatted with Brian at the break between the 4th and 5th mile and he had pulled out because of a sore hamstring muscle. We agreed that I'd try to do the 5th mile but if I wasn't able to loosen it up, I should quit. After one lap, it was still really tight so I pulled out. So, not a very successful night for running. Or, perhaps, the attitude should be that it was successful, because I didn't get injured. We know from experience that there is a fine line between working your muscles hard enough that they are sore and repair themselves even stronger than before -- and working them too hard that they can't be repaired in time for you to race strongly. I'm pretty sure we didn't cross that line. 2 days rest and then we'll see how I fare on the tempo run! My average pace for the run was 4:51 per kilometre -- exactly what I need to do over 26.2 miles in order to get my target 3:25 PR. The weather for this run was pretty good -- 18 degrees C. and overcast -- and I felt strong the whole way. Chalk it up as another good run! The weather was excellent. About 7 degrees C. (45 F.) and with a slight wind from the east, which made running east more work than running west. All in all, it was a good workout. My muscles are appropriately sore, so it must have been good! Coach Brian had me scheduled to do 17 miles today, but the Runners Choice marathon training group was going to do the Springbank Half Marathon in preparation for the Corning Marathon in 3 weeks. John Ferguson, the legend, wanted everyone to "race" it -- not just use it as a marathon pace run. But Coach said that since I was still 8 weeks out from the marathon, running it as a pace run would be a good idea. To put an added twist, though, he wanted me to do 4 warmup miles before the race. As usual, Coach was right. The run wasn't the easiest -- lots of little hills that ripped apart your quads -- but I managed to beat my target pace by a second or two pretty much every kilometre. And with 4 kilometres to go, I tried to step it up a bit. While keeping at a 4:52/k marathon pace would have had me cross the finish in 1:42:36, I managed to pull off a 1:41:23. And with the last kilometre basically uphill, that was no small feat. This was my 3rd fastest half marathon time, the other two being the Forest City Half (1:40:18 in 2009 -- 2 weeks after Boston) and the 2008 Canada Day run (1:39:43 -- although that route may have been 200 - 300 metres too short). So, I would say my conditioning is definitely improving. Perhaps not quite as good as I was last year for Boston, but definitely getting close. Brian said I can put this one in the books as another successful run! Wow, does the cooler weather (and a bit of a rest) ever make a difference! I didn't do speed work on Tuesday because I bruised the sole of my right foot when I ran over a stone on my Monday long run. I figured that I shouldn't do something that would cause more problems, so I rested until it felt better. For the tempo run today, the group was doing 8 miles, so I went out targeting 5:11/km (30 seconds/mile slower than race pace) and planned to come back at 4:40/km (7:30/mile -- 20 seconds faster than race pace). So my last 2.5 km was at roughly a 4:24/k. average pace (7:05/mile)! This definitely makes up for some of the tough runs earlier in the training! Today was relatively cool. The temperature when I started running at 7:00 am was around 14 degrees C. and it warmed up to about 18 degrees by the time I finished near 10 am. But the sun managed to stay behind the clouds. There was a light breeze coming from the south when I started, which turned into a fairly stiff breeze from the south by the time I finished. I had a tough time on a couple of the latter 'fast' laps as I was heading directly into the stiff breeze, which had a significant effect on time and effort. Once I turned the corner, though, I was able to get back into my rhythm and ramp up the pace for the last 1.2 km. I took a 2-3 minute break every 8 km, roughly, to get some water, dry off and, at the last stop, eat a peach. Overall, quite a good run. Muscles are sore, which is good. Today we stepped up the number of one mile repeats to 6, each separated by a 2.5 minute break. I started early -- 6:45 AM, but the sun was rising and therefore the temperature was starting to rise as well. Best guess is that it was 21 degrees C. when I started and 23 when I finished. But those temperatures are in the shade. In the sun it was easily 3 or 4 degrees warmer. So I hit the targets pretty much right on. I was sweating profusely during the run -- my hand towel that I carry was soaked -- but taking off my shirt after first 2 miles definitely helped to keep me cooler. It has definitely been a fairly warm summer, which has made those long runs somewhat challenging, considering my propensity to collapse during hot weather runs. Since I was so busy with horsey stuff this past weekend, I did my long run this morning (Monday). Coach Brian wanted me to do 18 to 19 miles (28.8-30.4 kilometres), with the last 2 to 5 miles at marathon pace (4:52/k or 7:50/mile). I got up a 6 AM and was out on the roads by 6:45. I kept pretty consistently to 5:11/k (8:20/mile) or better for the first 24 kilometres. I did those 24 kilometres in 8k loops of the block on which we live, so every pass around I'd stop for a quick break. "Quick", of course, is all relative. At the start it was just enough to gobble down a peach and take a schlurp of water. But during the 2nd break, I took about 5 minutes to cool down. The sun was up and beating down on me, and I could feel the heat. By the time I was done the 24 kilometres -- and gearing up for the last push at marathon pace -- I felt like I was about 1000 degrees (and at that point, it doesn't really matter if it is Farenheit or Celcius -- it's just friggin' hot!). So my plan was simply to cool down -- and take as long as I needed to cool down -- before heading back out onto the road. Jenny got me ice in a towel to put over the back of my neck and on my back. I sat in the shade and just dripped. But after about 10-20 minutes (felt longer), I headed back out. No shirt. Just needed to get the remaining run in. So, it was a tough run. It wasn't an ideal run, considering the rest breaks. But I definitely did the mileage and I definitely did it when I was tired. I just didn't do it when I had a core temperature that would fry an egg (and my brain). I'm going to chalk this up as a tough but successful run. Tempo Run - 8 miles (4 at tempo pace)... much better this week! This week went _much_ better. Coach wanted me to do 3.5 miles out at long-run pace and then run back at between 20 and 30 seconds faster than target marathon pace on the way back (7:20/mile or 4:33 per km. to between 7:30/mile or 4:40 per km). I was feeling pretty good at the 3.5 mile mark, so I kept going to a full 4 miles out. And when I turned around to come back at the tempo pace, I knew it was going to be a better night. So, it was a 100% change from 2 weeks ago. Definitely feel better! Coach Brian ran with me this morning. We did the same as last week: 5 repeats of 1 mile, with 2.5 minutes of rest between each repeat. It went very well. While the temperature wasn't as cool as last week, it wasn't terrible. We knocked off 4 x 1 mile repeats at roughly 7:00 per mile and the stepped it up to a 6:47/mile (4:13/km) pace for the last repeat. Day 2 of Simcoe Shores started shortly after midnight. At 12:05 am, I took off on an 8.6km run through trails outside of Penetanguishine. It was a tough run: The trail on which I was running was quite uneven -- and since it was unlit (other than my not-bright-enough headlamp), I was continually having to watch my step or I'd be eating some stone dust. I muddled through the rest of the trail and with about 2 km to go, I hit the roadway and was able to pickup the pace a bit. Overall, I was pretty much right on track: 4:46 per kilometre. My final run started at 8:14 am, right after Jenny battled her way halfway up Blue Mountain. And when I say halfway up, what I mean is that I had to go the other halfway up. This was a 12.1 km run and the first 3 km were basically uphill. The 4th km was hilly, but better. And after that, it was generally downhill, but my legs were shot. I walked every km and my support crew of Jody, Tori and Graham did a great job of keeping me hydrated and lucid! The average pace sucked -- 5:23 per km -- but that was as good as I could do. And considering the terrain, I'll take it! Overall, we had a great time and finished 3rd out of 5 in our Mixed 35-45 division (average age, at least half the legs were run by females). And after roughly 24 hours of running we were 15 minutes off the 2nd place team. I skipped the tempo run this week to 'taper' for the Simcoe Shores 244 km run from Barrie to Collingwood, via Coldwater, Midland, Penetanguishene and Wasaga. My first run was this morning at 9:00. I was the lead runner and my first leg of 24 in the race was 10.6 km. Jenny organized the times and had me down for 4:45 per kilometer, based on my last 10k run at the Hog Jog in June. Not a bad benchmark, actually, because that was a tough, hilly run. Anyhow, I knocked off that first 10.6 km run with an average pace of 4:40 per km. But it was a very straightforward, relatively flat so there was little to upset the pace that I established fairly early on. The second run was also about 10.6 km, and the terrain was a bit more hilly. But I was able to knock it off with an average pace of 4:39/km. I came across drained, but felt good to hit the pace. Coach is away this week camping, so I was on my own for speed work. The Legendary John Ferguson's Marathon Training plan called for 5 or 6 repeats of a mile, separated by a 2 and a half minute rest. As I headed out the door, I instantly noticed that it was cooler than usual -- probably 16 or 17 degrees C. Felt good! It's been a while since I've done mile repeats, so I figured I'd start with 5 reps for this time around. And for a pace, I wanted to keep it a bit slower than the 1 km repeats I was doing before, so I targeted 7:00 per mile (4:21 per kilometer). The first two repeats were pretty close to the 7:00/mile target. But on the third, I found myself running considerably faster than target pace -- so I decided to step up the target pace to 6:50/mile (4:15/km). There was a light wind coming from the east, so on those eastward repeats I was working considerably harder than when I was heading west with the wind at my back. But I was able to knock off times between 6:45 and 6:50/mile for the last 3 repeats. My breathing felt good and I felt like I recovered relatively quickly. The cooler weather definitely made a difference. It was really nice to have a successful run under my belt again! Definitely not a week for the record books. I was in the Newmarket-Aurora Ontario area this weekend for Polo for the Cure, in which my daughter Tori was participating. Since her team's Friday win got them a ticket to the Sunday final game, I figured I'd run on Saturday. But the forecast all weekend was 'hot and humid', so I figured I'd be best to head out as early as possible. Coach Brian wanted me to do 18 miles, with the last 5 miles at race pace. I went out at 6:30 am. Our hotel is on Yonge Street, and as I left I knew I want to be doing as much as possible of the race-pace section of my run on flat or downhill grade. Flat was out of the question. In the Newmarket-Aurora area, there is no such thing. Everything is rolling hills, and lots of 'em. So I headed south from the top of Newmarket, through Aurora to the top of Richmond Hill before turning around. I kept my pace slow for the 'long run pace' section of the run -- targeting 5:30/km (8:51/mile) and had no problem knocking of the kilometers. I had to work hard on the uphill sections, but could take a breather on the downhill sections. Again, there was nothing that resembled 'flat'. As you can see, the wheels fell off of my plan. The problem was a combination of the heat and the hills -- probably in equal proportions. The last 8km was a net 50 m uphill, but with lots of ups and downs in between. Pretty good Boston-type training terrain, if you ask me! Oh, and I forgot to mention. I took a break with 4 km to go in a shady spot for about 2 minutes. And then with 2 km to go, I took about a 5 minute break -- maybe longer (I had to try to puke, which took a bit of time). I just got to the bottom of the last long hill and couldn't face it at that pace. So, two crappy runs in a row this week! One saving grace is that when I was training during the summer back in 2007, I was running into the same heat related issues. I can't wait until the nicer (read:cooler) weather arrives! I did my tempo run this evening again with the Runner's Choice Marathon Training Group in London. Coach Brian suggested a 9 mile (14.4 km) tempo run -- just like last week -- with the second half of the run at better-than-race pace. We targeted an 8:15/mile (5:07/km) pace going out, and then we were looking for a 7:30/mile (4:40/km) pace coming back. Coach Brian would pace me and fellow runner Berne Leforte was going to join us for as long as he could. Well, that's how it started. It was a warm night and it is well documented in text and video that I don't react well in the heat. The run out to the turnaround point was fine. But when we stated back, the internal temperature started to rise and with about 1.5 miles to go (i.e. only 3 miles into the fast part of the run), I had to walk. Bernie had lots of energy though, and kept on truckin'. Brian and I eventually picked up a jog, and then for the last mile back, we picked it back up to something resembling tempo pace. About the only saving grace was that lots of other runners were having similar issues. And, as Brian said, if you hit all of your goal times, you probably didn't set the goal high enough. Well, clearly the 3:25 marathon goal time is high enough! The average time was 5:00 per km. -- the same pace as I did in Boston last year. This was just 1/3 the distance, but between the heat and the hills on the way back, I simply couldn't do it. Tonight I joined the Runners Choice's Marathon Training program at TD Waterhouse Stadium at the UWO. The legendary John Ferguson was running a 'ladder' -- speed work repeats at distances of 400, 800, 1200, 1600, 1200, 800 and 400 metres with a 2 minute jog/rest break in between repeats. The goal is to pick a pace that you can achieve at all of these distances. Coach Brian and I chatted about it and figured a 7:20/mile pace (1:50/400m) would be a good starting point. So as you can see, my 400m laps were rather fast, but my target pace of 1:45/400m was pretty much bang-on for the other repeats. And it felt good to leave it all out there on that last lap! For the next ladder, though, I think I'll target around 1:40/400m which will stress me a bit more. We did the annual 8k trail run in Exeter today, as part of the legendary John Ferguson's marathon training program. I've done this race several times before, logging finish times of 38:31 (2006), 35:59 (2007) and 36:24 (2009). So my goal going into this one was to beat 36 minutes again (4:30/k). I confess, though, that as I started into the run I had my doubts. I could still feel the effect on my legs from my 9 mile tempo run 2 days prior -- or perhaps it was the horse trials in which I participated yesterday. My finish time was 36:54 -- so not bad, but not great. Not sure what to make of it. Coach Brian said we were both about a minute off our ideal times to predict a marathon finish where we'd like it to be -- and one could definitely attribute that difference to the fact that the trail was quite hilly. So, we'll leave it as 'It is what it is'. Next year I hope to be working harder on my short distance times, so maybe that will be the year I set a new PR on this course! Coach Brian suggested an 8 to 9 mile tempo run this week so I picked something close to 9 miles -- 14 kilometres (about 400 m. short of 9 miles). As usual, I did the first half at 'long run' pace (5:20/k or 8:35/mile) and then stepped it up to something better than race pace for the second half. I was targeting 4:40/k or 7:30/mile. Race pace for me is 7:30/mile or 4:52 per kilometre, which would have me travel 26.2 miles in 3:25:14. It was first thing in the morning when I took off from the house -- roughly 6:25 am -- and the sun was just coming up. The temperature was comfortable -- about 20 degrees C. -- and there was just a light breeze. As you can see, I had trouble getting the pace at the start, despite the fact that I was running on a slight downhill grade. And I wanted to walk a gazillion times. But as I got closer to the finish, I focused on my form and 'getting through it'. The last kilometer was on a slight uphill grade on a gravel road, so hitting a 4:31 pace (7:17/mile) wasn't bad. I weighed myself this morning after the run and I was just under 180 lbs. for the first time in the training. So if I can keep this weight or better, I should be in fine form for November! Deja vu all over again? Yes I did five 1 kilometre repeats 2 weeks ago as our first speed work session. The original plan was to do six repeats, but the weather is really muggy today so Coach Brian emailed me to tell me to tone it down to just 5 repeats at 4:15-ish per k, with a 2 minute rest between laps. After the first repeat, I thought 'Hey, this is going to be a breeze.' but by the time I was done the third repeat, I was starting to wish I was dead. The air was positively thick. One thing I learned though is that if I concentrate on keeping head high to keep my airway as open as possible, I seemed to get a bit more oxygen into the system and I didn't seem to fatigue as quickly. Maybe its all in my head, but it seemed to make a difference. for an average of 4:11 per kilometre. And while I was definitely tired after each lap, I felt strong -- certainly much stronger than 2 weeks ago. And my average pace was 2 seconds faster than 2 weeks ago, so it is possible that I'm already gaining endurance and muscle. My weight was right around 182 lbs after the run. Its been stable within a range of about 181 at the low end to 187 at the high end. Okay, 14 miles isn't _that_ long in the grand scheme of things. But we did 19 miles last week, so this was a step back a bit in terms of mileage -- but not in effort. Brian wanted me to put in 6 miles at marathon pace (4:52/k, 7:50/mile) -- but I thought it was supposed to be 4:50/k so I was a tad fast in my goal pace. A couple of kilometres into the 'long run pace' part of the run, Rishi Kumar caught up with me and we ran together to the 7 mile turn around point, and then he joined me for the first 2.5 miles back towards downtown London. Rishi is training for the Chicago Marathon and is hoping to do a 3:44. Based on his pace today, he'll have no problem! with an average of 4:47.3 per kilometre (7:42/mile) -- enough to get me across the finish in 3:22 if I were to keep it up for 26.2 miles. So, it was a good run. Brian, Arnie and I went to Ritchies Family Restaurant at Fanshawe Park Road and Richmond Street for breakfast to celebrate. Wonderful having Eggs Benedict with a Coors Light after a successful run! 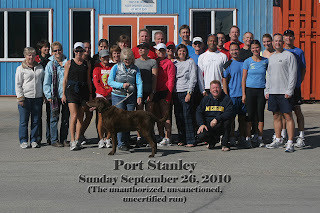 Jenny and I, back from our Cruise-To-Run in the Caribbean, went to speed work with the Runner's Choice gang tonight. I did 12 x 600m at 2:30 per repeat with about 1:10 between each sprint. That's a 4:10/k pace or 6:42/mile. Jenny was just slightly off that pace at between 2:33 and 2:36 per 600 m. repeat (6:51 to 6:59/mile). I think next time I'll try to pace with her and step it up at the end. Jenny and I did 10 miles including 7 miles at tempo pace through the streets of Lucan tonight. The laps were 10:04, 8:53, 8:20, 8:21, 8:16, 8:14, 8:12, 8:20, 8:12 and 9:35. The weather was good -- about -3 C. with minimal wind. About half the roads were bare and dry, the other half was snow-covered and slippy.